We have a tradition of the whole family making cookies and other treats together on Christmas Eve every year. It's something we will always remember and the kids can take those memories with them as they grow up. We usually make sugar cookies in various shapes and then let the kids ice and sprinkle them. This year we will be making some new shapes, and adding a little more creativity with the ice with our new Christmas Cookie Set Gift Bundle. My daughter was pretty excited about the set because the tools are just the perfect size for her smaller hands. 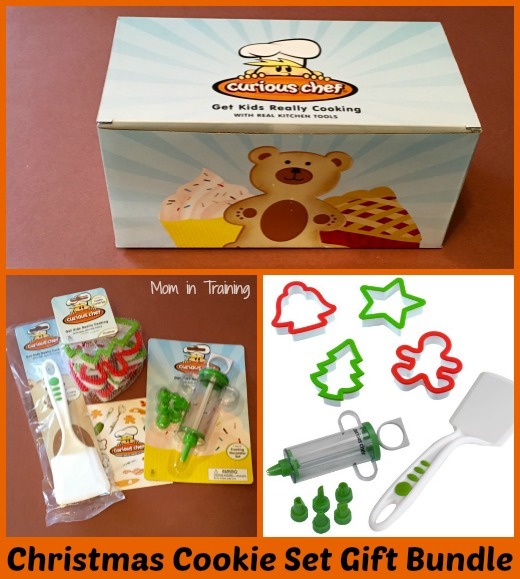 The Curious Chef® Christmas Cookie Set Gift Bundle is a great way to make special memories with your budding young chef. Your little baker will love these real kitchen tools for kids. The bundle includes the Curious Chef® 4-Piece Christmas Cookie Cutter Set, 7-Piece Decorator Set and Nylon Cookie Turner. Featuring an over-sized shape and colorful soft-touch grips, the Curious Chef® 4-Piece Christmas Cookie Cutter Set includes star, gingerbread man, angel and tree shape cutter designs. Top off the delicious holiday masterpieces using the 7-piece decorator set. The set includes six unique shapes. Simply fill the over-sized frosting tube and push down on the easy-to-use plunger for fun and creative designs. And the Curious Chef® Nylon Cookie Turner is a safe and easy way for your kitchen helpers to remove cookies from cooled trays. The turner is designed with a soft-touch, easy-to-grasp handle and an over-sized surface area. This bundle makes a great gift for kids. Buy it: You can find this and other gift bundles on the Curious Chef website. They actually have a really cute cookie gift set bundle that would be perfect for any time of the year! The cookie cutters are cute. I love baking with my daughter for the holidays!